With 1 million new cases of congestive heart failure diagnosed each year, a revolutionary product is making it easier for hospitals to monitor patients with the condition in the comfort of their own homes. A toilet-seat based cardiovascular monitoring system created by a team of Rochester Institute of Technology researchers aims to lower the hospital readmission rates of patients with congestive heart failure. The toilet seats, which will be brought through the FDA clearance process by the researchers’ company Heart Health Intelligence, would be purchased by hospitals and issued to heart failure patients after discharge. The toilet seats are equipped to measure the electrical and mechanical activity of the heart, and can monitor heart rate, blood pressure, blood oxygenation levels, and the patient’s weight and stroke volume, which is the amount of blood pumped out of the heart at every beat. Algorithms analyze the data, and with further development, will alert advanced practice providers of a deteriorating condition. A report will be passed along to cardiologists who will then determine if intervention is necessary. 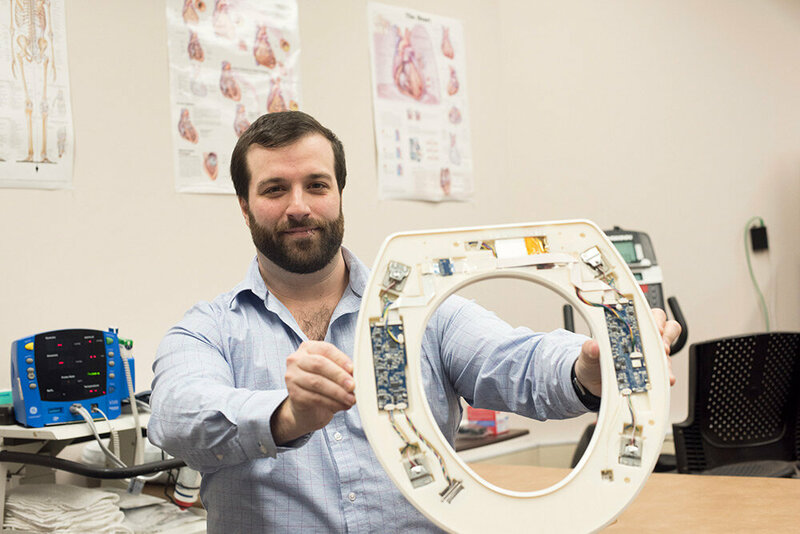 Nicholas Conn, a postdoctoral fellow at RIT and founder and CEO of Heart Health Intelligence, is part of the university team that developed the toilet seats. Conn, the company’s chief executive officer, further explains that using the national average for readmission rates, the penalty alone for readmitting 150 patients is approximately $500,000 annually. The total cost of providing 150 patients with their own monitored toilet seats from HHI is $200,000. With that investment, he says, hospital systems will save more than double their initial investment within one year. According to Conn, who earned three degrees from RIT—a bachelor’s degree and a master’s degree in electrical engineering in 2011 and 2013, respectively, and a doctoral degree in microsystems engineering in 2016—the system will pick up deteriorating conditions before the patients even realize they are symptomatic. And with the rapid data analysis, interventions can be as simple as a drug change or short office visit, instead of an admission to the hospital. HHI, which joined RIT’s Venture Creations business incubator earlier this year, is now focused on moving the product forward. The team is heavily involved in writing grants for additional funding and networking, and human-subject testing and pre-clinical studies are well underway. Conn and his team are working on approving the product with the FDA and rolling it out across the country.